Paul had several distressing experiences as a young person and became depressed and suicidal. He was admitted to hospital on several occasions in his 20's. Paul has bipolar disorder and was first referred to Advance through his social worker after having had a nervous breakdown. At the time he was living in a hostel in the Worcester area and needed a permanent place to call home. His first experience of Advance was moving into one of our one-bedroom supported living flats where he lived happily for several years and generally felt better in himself. However, Paul felt he needed more independence and his own space. He saw an article about HOLD in Advance Times, the Advance customer newsletter, and knew that he wanted to look into shared ownership and that he wanted to apply. Happily Paul was able to find a property and purchase it with the support of the benefits he received. In 2004 he moved into his own 3 bedroom house in the Worcester area, which he loves. Since moving in he has gradually been able to increase his share of ownership. Paul is a keen artist and uses his work to help him deal with his mental health condition and to find peace. Many of his drawings and paintings are displayed on the walls of his home. He has submitted a number of his pieces of work to local competitions and has had his work appear in the pages of Advance Times. Shared ownership gave Paul the independence and freedom to live as he wanted. HOLD enabled him to find a property in the area where he grew up and establish a permanent base there. It also happens to be where his brothers live and makes it easy for them to visit him regularly. 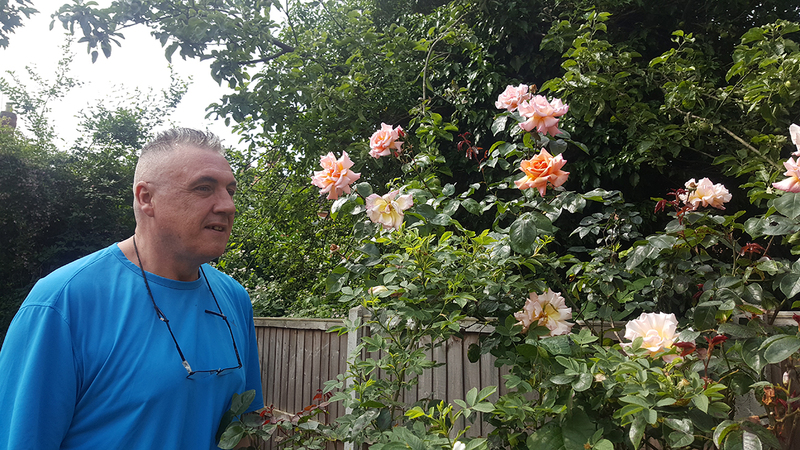 By having his own garden Paul has been able to explore his passion for gardening. He grows roses, peonies and strawberries in the back garden and takes great pride in it. He likes to spend his time sitting outside, admiring his plants and listening to the birds. Having the stability of a permanent home in the area has also enabled him to enrol in various short courses at his local college, taking up IT, creative writing and Spanish and he is able to regularly attend a local mental health survivor’s support group in Worcester.